Lewis Hamilton (2nd, 1:19.794): "It's great to be back here in Mexico. The support we've had here already is amazing - and it's only Friday! There's so much energy and enthusiasm for the sport here, which is great to see. It's been a solid day in terms of our programme for the weekend. The cars are obviously faster but lap times are pretty strong already. The track is feeling better than it did last year and I feel a lot more comfortable in the car than I did the first time we came to this circuit, so hopefully I can carry that through the rest of the weekend." 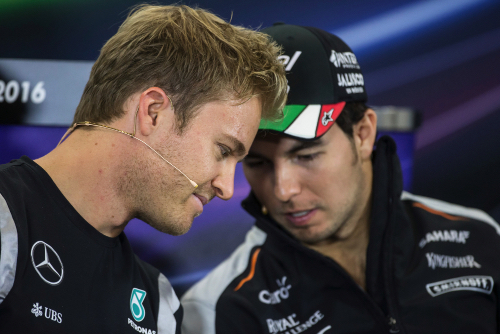 Nico Rosberg (3rd, 1:20.225): "It was an unusual day out there with the low temperatures and a very green track. So, it's been a bit of a steep learning curve to understand what to do with the tyres - how to get the best out of them for one lap and also for the long runs. We really learned a lot today and it's not been a bad start overall but we have a lot of homework to do tonight. The car was feeling okay on the medium tyre but even there we need to make some progress to understand where we can find some performance. Ferrari seemed very quick here today, so they will be a big threat. Let's see how tomorrow goes. It feels great to be back in Mexico. The fans are outstanding here. Already on Friday it's really packed out there in the stands, which is awesome." Paddy Lowe: "A good day's work. Very cold, which we weren't really prepared for, and a circuit that was dirty to start off with. But this all soon settled down and we ran a problem-free programme, looking at the three different tyre compounds and their performance for qualifying and the race as usual. We also did a lot more work than usual with engine and brake settings to tune the car to this high altitude. It was quite a complicated day from a data point of view and, comparing ourselves to the opposition, it looks very close between the top three teams as things stand. It's great to see such and large and energetic crowd - already on a Friday. We look forward to some good on-track battles and more of this brilliant atmosphere over the next two days." Sebastian Vettel (1st, 1:19.790): "Overall it was a good day: the car seems to work, not only judging from the result but also as an overall feeling. The pace was there not only for one lap, but for all the laps we have completed. Also, we were always ahead of schedule leaving the garage, which is not always the case. For sure it is nice to be first in the time sheets, but this doesn't mean anything on Friday. If we are in the same position tomorrow afternoon, then we can be happy. Anyway, I felt that I was in Mexico city, not on the race track, with all the traffic! I think everybody was fighting with the same problems, trying to make the tires last, especially the Supersofts. I didn't have successive laps because I had so much traffic, but overall the pace was good, which is the most important thing. I think we can still improve for tomorrow and go from there." Kimi Raikkonen (4th, 1:20.259): "Overall it was pretty ok today, but it's still early to know where we are and how's going to be. I had some understeer, mainly in the afternoon, with new tires on it was a bit tricky, but it's still the first day of practice. Now we have to concentrate and work on a few things as we normally do after the Friday's session and hopefully tomorrow, on new tires, we can push a bit more." Valtteri Bottas (8th, 1:20.629): "I think it was a good day for us. We definitely still have a lot of work to do with the balance; the track was obviously improving a lot so the feeling of the car gets better and better with every single lap. The long runs seemed to be competitive with the supersoft and the medium, so hopefully we're looking at a good weekend ahead for us. We still need to make sure that we work hard tonight to make the changes we need to get more performance." Felipe Massa (13th, 1:21.326): "It was very difficult to understand the tyres today. The track is just very low grip, but it's improving every time we go out. You can go out and have no grip, but then suddenly at the end of the run the grip improves. So, I think understanding the tyres this weekend will be very important for the result at the end of the race. I wasn't happy with the result on the new tyres, but I was happy on the longer runs. We just need to work on understanding everything." Rob Smedley, Head of Performance Engineering: "It's quite hard to read today because of the nature of this track, and with everybody struggling to get the tyres to work. Either the fronts weren't working, or then suddenly they would work and you get oversteer, which we saw from FP1 to FP2 on those running the medium tyres. Overall it's been a fairly quiet day for us. We completed all of the work we needed to, and I'm reasonably happy with where we are on both low and high fuel. There was quite a lot of graining on the soft and supersoft for everybody, but we seemed pretty good both this morning and this afternoon in having relatively low graining, especially on the front tyres. The focus for tomorrow will be on getting our low fuel set-up right and I'm confident that we have a good direction for that." Daniel Ricciardo (5th, 1:20.448): "It's really difficult to find the right set-up with these conditions, when there is low grip you have a bit of under-steer and also a bit of over-steer so setting the car up is tricky. I think we improved from the morning but there is still some progress to make so we'll still prepare for a pretty low-grip track tomorrow and try to improve the balance. I think it will get better, I expected the grip to be higher after a year but it was still very slippery. By Sunday the last half of the race will be better but I think we'll fight the balance from now until the end, trying to get comfortable with a slick-feeling track. The supersoft today wasn't a great tyre for the long runs as it wasn't lasting. I don't know how the others got on but I believe everyone has had a few problems with that compound so it'll be interesting in qualifying tomorrow. We might see a mixed bag again." Max Verstappen (7th, 1:20.619): "It was not ideal to miss a lot of the first practice session because of my brakes overheating, but we did some good work on the car in the second session which was positive. The brake issue was from pushing a bit hard on the in lap, therefore the temperatures were higher than usual. Due to the time I missed this morning I am still not completely happy with the set-up of the car over a short distance, but I think we have found a good long run pace for now. It was a bit tricky out there on supersofts but the car felt especially good on the medium compound, which I think is a good sign for race day. I think we can be competitive on Sunday as I was still making set-up changes towards the end of the second session, they are starting to come together now so I can improve from here. The make-up is off today, so it's game face for the rest of the weekend." Nico Hulkenberg (6th, 1:20.574): "The main focus on Friday is to complete your programme without issues, and from this perspective we had a good day. Most of the challenges we are facing are the same as last year - the altitude makes a big difference to the feel of the car with a loss of downforce - so we need to adapt to the conditions to find the ideal balance for the car. The rest of the day was quite standard, mostly learning about the tyre compounds, and I feel we did a good job with it. The morning session didn't tell us much: the track was very cold and very dirty, so getting good information was difficult. We were able to assess the tyres in the afternoon and there wasn't any particular surprise. In terms of car balance, we have made a good start but I am not completely happy yet: there is still a good margin for improvement and I hope we can dial our car in to find it overnight." Sergio Perez (15th, 1:21.579): "Racing at home is a very emotional moment, but when I get in the car it's important that I treat this weekend like any other race. The morning went very well and I had a good feeling with the car. I struggled more in the afternoon, but we know where we need to focus and the direction we need to take to improve for tomorrow. The conditions today were not what we anticipated, but the rest of the weekend should be warmer: we will need to set the car up for what we think we are going to find on race day, but I think the data we collected today will allow us to do so." Robert Fernley, Deputy Team Principal: "It was very cold this morning, meaning the conditions weren't very representative of what we expect for the rest of the weekend. Track temperatures were slightly higher in the afternoon, and we could focus on understanding the two race tyre compounds: medium and soft. We didn't have any interruptions and gathered a lot of good data about how to set the car up on race day. Overall, Nico appears happier with the base balance of the car, whereas there are still a few elements on which to work with Sergio. Our focus now is on preparing the car for qualifying with a view to extracting the most out of it - it's the work we will be doing in the final practice session tomorrow morning." Kevin Magnussen (14th, 1:21.442): "We made some good progress with the car today. It was my first time driving this circuit and I'm happy we were able to get the car dialled-in where we wanted as it felt much better in the second session. It's the altitude that takes your breath away here rather than the track layout, which is pretty straight-forward. I certainly want some more grip tomorrow." Jolyon Palmer (16th, 1:21.785): "That was a reasonable Friday for us however we still need to work on the balance of the car as it isn't where I want it. The track is certainly slippery. We saw the grip improve over the sessions today and we'd certainly expect it to improve further tomorrow and on Sunday. I would have liked to have felt a little happier at the end of the day today, so we've got some work to do." Nick Chester, Technical Director: "From a technical perspective it was a solid day for us: we completed our programme, we ran with the HALO for the first time, we saw no problems with the cars and both drivers we reasonably happy. On Kevin's side of the garage the balance improved for FP2 and he was able to post some reasonable laps in that session. Jolyon still isn't 100% happy with the balance on his car so there's a little work to be done there. Now our focus is working out how to get the maximum from the tyres including extending the super soft compound's performance life. We saw a lot of track surface improvement over the course of the day and we expect that to continue tomorrow and beyond." Carlos Sainz (9th, 1:20.974): "I'd say it's been an interesting Friday. In particular, with the supersoft tyre being introduced here this year and the fact that the track temperatures have been super low today, I think it's been a very challenging day - not only for us but for the whole grid. Hopefully this will create some opportunities for us on Sunday. At the moment we've performed well - inside the top ten - but we can't forget that it's only Friday, we know that things can change quickly on Saturdays. The good thing is that we've started the weekend positively and we will remain calm, work hard, extract the maximum out of the car and see where we end up!" Daniil Kvyat (11th, 1:21.193): "I think it was a good day. We've ticked most of the boxes on our programme and I'm happy with how both practice sessions went - my race engineer Pierre is happy too, so that's good! We now have to analyse all the data collected and get ready for the rest of the weekend. I'm feeling good in the car, even if the conditions out there today were a bit tricky because it's very cold - therefore, like all the other teams, we will also need to find a good approach for this kind of conditions. We will work hard tonight and tomorrow we will see who's done the best job." Jody Egginton, Head of Vehicle Performance: "I think we can be pleased with the work we have done on both sides of the garage today. Both cars had a reasonable baseline balance out of the box, which meant we could directly focus on the run programme whilst also giving consideration to the fact that the low track and ambient temperatures in FP1 were having a notable effect on tyre performance, especially with the higher working range soft compound. We achieved our FP1 objectives in terms of ensuring that the various systems were performing as expected in this challenging environment. We also gathered tyre data which, even if it was effected by the running conditions, it was in line with expectations. Changes ahead of FP2 were limited to small adjustments and changes in line with increased track and ambient temperatures. The FP2 run programme was completed with short run performance being okay, although we still have to work hard optimising the parts of our package we can influence, to try and compensate for areas of the package which are more fixed. As expected, the long run with the supersoft compound was challenging, but this was also the case in Austin so we are confident we can find some more performance on this compound. The soft and medium tyre performed as expected, so overall we are happy. One of the key points for the remainder of the weekend will be to keep an eye on the track and ambient temperature change, together with further set up optimisation and, if we manage this as well as we did in Austin, then we should be in good shape." Marcus Ericsson (18th, 1:21.997): "It's been a productive day. We had two problem-free practice sessions during which we have tried different car set-ups. After analysing all the data tonight, we will know more about which way to go for the rest of the weekend. All in all it has been a little bit difficult to get a good read of the car, because of the low grip conditions as well as rather low temperatures, but this is the same for everyone. We need to find a way to get the car to work at its best in these conditions. This will be the main challenge for us for the rest of the weekend." Felipe Nasr (19th, 1:22.037): "We had a couple of issues today. I had a broken front wing after I ran over the kerbs at the exit of Turn 11, which caused damage to the car. Because of this incident, we lost quite a significant amount of time in the morning. Thanks to the mechancis, as they were able to put the car together again, I went out again for three laps at the end of FP1. Besides that, I have tested the halo system. It was okay to run it, and I did not have issues with driveability. It was just a matter of getting used to it. In the afternoon session I was compromised by traffic on my quick laps. On the long-runs we seem to have a decent pace on the medium tyres, which is positive." Fernando Alonso (10th, 1:21.003): "It has been a demanding day for everyone, with a very dirty and slippery track, like last year. In the first session, we tried a few things on the car, then in the second session we tested different tyre compounds, but the degradation was quite significant. The situation will surely improve tomorrow and on Sunday, when the track will clean up and we will have much more grip. At the end of the second session we saw an anomaly in the braking system so we stopped, as a precaution, to do some checks. Tomorrow we'll be working more on finding performance, but, even so, making it into Q3 may not be easy." Jenson Button (12th, 1:21.198): "We started off this morning doing quite a lot of general testing work, so FP1 wasn't so useful for this weekend. In FP2 we could do a lot more Mexico-specific testing - we worked a lot on the balance - and we finally found something that's a bit more interesting. I don't think it's ever going to feel good here, with such low grip because of the thin air, but hopefully we've found something we can work with tomorrow. There's quite a bit of graining on the Supersoft tyre, but the degradation got better throughout the session. The long runs were tricky though, and I think everyone found that on the Supersoft, but we've just got to try to make the best of what we have. At the start of the race I think a lot of cars on the Supersoft will be pitting four or five laps in, but that'll mix it up and I think it'll add a bit of excitement. The Medium tyre is working better than the other two: it lasts the longest and we haven't seen any graining on it so far, but there's correspondingly less grip on it. I think we're on the edge of the top 10. It might be a little bit more difficult than at the last race, but it's not such a bad thing to be just outside the top 10 because that way you get a choice on tyre strategy. Obviously we'll try our best to get into Q3, even so, but the race strategy is more important than the kudos of Q3, and the goal is to score points. Finally, it's really nice to see so many people here already on a Friday. The fans are fantastic here and there's a lot of support for Formula 1. There's a great atmosphere - I'm looking forward to the weekend." Eric Boullier, Racing Director: "This morning we were perhaps a little surprised by the very cold weather, which chilled the track surface considerably, but both our drivers nonetheless coped well with the consequent lower-than-expected tyre temperatures, the result being an incident-free FP1 session for us. However, this afternoon, as the air temperatures increased, taking the chill off the asphalt, both Fernando and Jenson reported better, more balanced and more driveable handling characteristics. Owing to the high altitude, the thin air makes things tricky aerodynamically though. We managed to complete all our planned programmes for both cars, across both sessions, and ended up a creditable if unspectacular 10th- and 12th-fastest at the end of FP2. We have a lot of number-crunching to do this evening, but we have reason to hope for a reasonable qualifying performance tomorrow afternoon, when the air temperature is forecast to pass 20 degrees Celsius for the first time since we've been here." Yusuke Hasegawa, Honda: "The first two free practices of the Mexican Grand Prix have been very busy. Owing to the very cold and dusty track conditions of this morning, we struggled with grip, making balance confirmation very difficult. Despite these conditions, FP1 was a very full session, confirming power unit performance balance in the high altitude environment, as well as general aero testing and chassis balance. During the lunch break the sun did help to warm up the track for FP2, whereby we performed our usual set-up changes and long runs to help us refine our package for tomorrow's running. With the improvement on our turbo, we can say that the overall altitude effect is much less than last year, but we still have a lot more engine mapping and deployment data to look at and tweak to make it better for tomorrow." Pascal Wehrlein (17th, 1:21.980): "Overall I feel positive about today. In fact, this is the first Friday I'm happy about since quite a long time. It was a fairly normal programme, other than that we started out slightly differently by working with the Soft tyre, before the Medium. Our pace looks good, more or less similar to Sauber, so I'm happy with that. And I like the track. It has a nice fast, flowing rhythm and it's fun to drive. So, a good start. It was quite challenging out there! We have been struggling a bit with tyre temperature, which is making our life a little bit more difficult, but we will do our best to improve for tomorrow." Esteban Ocon (21st, 1:22.298): "Honestly, it has been a difficult start to the weekend for us. We've struggled a bit today with how the car is handling. We tried some different things to try to improve, but it was still difficult to drive. We need to have a good look at why and see what we can do to get around that for tomorrow. I really like the track here, it's very challenging with high speed sections, which is great, but it requires more confidence to get a good lap time. I think to some extent we'll be starting afresh tomorrow. Hopefully we'll have solved the issues and we'll be able to squeeze a lot of things into FP3 to get back up to speed and to where we need to be ahead of qualifying." Dave Ryan, Racing Director: "We've made a reasonably good start to our weekend here. In fact, FP2 was our second best practice session of the season, in terms of our performance relative to the fastest car. It is however only Friday, so we'll see that for what it is at this stage - an encouraging start. It has been a pretty cold day here, which presented a few challenges with the tyres and grip levels, but nevertheless Pascal had a good couple of sessions and seems quite comfortable. Esteban experienced a few handling issues with his car, which we'll need to get on top of tonight to give him the best shot at tomorrow." Romain Grosjean (20th, 1:22.105): "The morning wasn't too bad, but our afternoon was disastrous. It's up to us to work around that. When we have problems like this on Friday, it tends to cost us on Sunday. Granted, we still have tomorrow, but we need to make the most of it in light of everything we dealt with today." Esteban Gutierrez (22nd, 1:22.408): "It was great to get to know my home circuit. It's very exciting to be here and to drive the track, which is amazing, in front of all the Mexican fans. We're going to have to keep working on the performance side of things, which isn't great at the moment. The car was difficult to drive during FP2 and had little grip. We'll be working on that tonight to try to sort out our setup and make things better for FP3 and qualifying." Guenther Steiner, Team Principal: "FP1 was a pretty good session for both Romain and Esteban and we managed to get all of our program completed. FP2, however, was not what we wanted. Romain had an immediate problem with the ECU and that stopped us. We had to change a lot of the electronic equipment, which left him with only the last 30 minutes of the session. So, we couldn't get everything done that we needed to do. With Esteban, he had no grip in comparison to FP1 and was just sliding around out there. We will be looking into this to see what we can find out and, hopefully, find a solution for FP3 tomorrow."